Planning to visit IKEA Tebrau or AEON Tebrau City? Public transport in Johor Bahru could take you conveniently to IKEA Tebrau. As IKEA Tebrau is located opposite AEON Tebrau City, you may refer to this article for buses to AEON Tebrau City too. Below are the tips on how to get there! 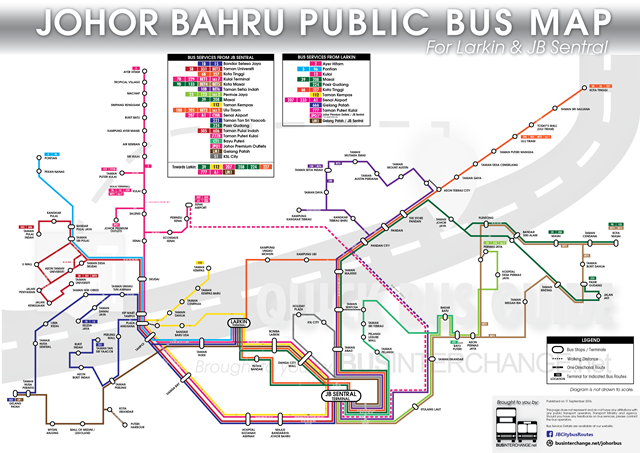 Public bus routes connecting to various towns are available near IKEA Tebrau and AEON Tebrau City. Please refer to the bus route details of each bus route on the individual pages for the exact bus routing. For bus routes under the Bas Muafakat Johor branding (route numbers starting with "P"), Kad Muafakat Johor must be presented upon boarding. In this article, we will focus on getting to IKEA Tebrau from the main bus terminal at Larkin and the city center at JB Sentral by bus. For public buses plying along the main road, we will recommend visitors to alight at the bus stops in front of AEON Tebrau City rather than the pair of bus stops in front of IKEA Tebrau, as there is no linkway available from the pair of bus stops nearest to IKEA Tebrau. If a linkway is built in the future, we will amend this article accordingly. JB Sentral is at the city centre of Johor Bahru, within walking distance from CIQ Johor Bahru or Johor Bahru Checkpoint / Custom. Note: IKEA Tebrau shuttle bus service has ceased operations since November 2018. Note: From 1 April 2019, bus service BET6 operated by Causeway Link has ceased operations. Frequent bus services are available to Ulu Tiram and Kota Tinggi, which are operated by most of the bus operators in Johor Bahru. However, these buses will call at the bus stop along the main road - Jalan Pandan - outside AEON Tebrau City, which means that a short walk is required to get to IKEA Tebrau. Do note that S&S buses may only put up signage of the destinations and not the bus route number. Fare: Usually RM2.50, please consult the driver onboard for exact fare. Change may be provided onboard buses operated by S&S (Bus route S&S 1) and City Bus (Bus routes 41 & 188). Please provide exact fare when boarding Maju (Bus routes 205, 227 & BET2) or Causeway Link (Bus route 808) buses. Alighting: When you see TESCO, it's time to press the bell and get ready to alight. Buses will stop at the bus stop outside AEON Tebrau City, along Jalan Pandan (Bus stop 3 on the easy diagram). Larkin Sentral is a popular bus terminal for intercity express buses, as well as cross-border buses to Singapore. Note: From 13 February 2018, IKEA Tebrau Shuttle bus service from Larkin has ceased operations. Bus route 66 operated by Causeway Link is the most convenient bus route available from Larkin to IKEA Tebrau, this is not the only bus service that connects Larkin to IKEA Tebrau. Bus route 227 operated by Maju is available from Larkin to IKEA Tebrau as well. However, as 227 will go to JB Sentral before proceeding to IKEA Tebrau, we will not recommend this bus route due to the prolong journey time. Fare: RM2.50 by Cash. Please provide exact change when boarding the bus. Alighting: When you see TESCO, it's time to press the bell and get ready to alight. Bus 66 will stop at the bus stop outside AEON Tebrau City, along Jalan Pandan (Bus stop 3 on the easy diagram). Direct public bus services are not available from Singapore to IKEA Tebrau and AEON Tebrau City. Passengers are recommended to enter Johor Bahru via Woodlands Checkpoint, and walk to JB Sentral. Please refer to the directions provided as above for details. Accessing IKEA Tebrau and AEON Tebrau City using the public transport from JB Sentral (within walking from JB CIQ) will be most convenient, when compared to using the Second Link (Tuas). Tour agency "Take Me To Malaysia" operates direct bus service from Singapore to AEON Tebrau City periodically to cater for the seasonal demand. Bus services to AEON Tebrau City were offered from Ang Mo Kio, Bishan and Punggol during the year end school holidays last year. Booking and payment for the bus tickets must be made through Easybook. As the bus services are not always in operation, please check out at the booking website for the availability of the bus trips. Select "One Way" on Easybook during booking of the ticket. Tickets purchased are inclusive of the return journey to Singapore, departing AEON Tebrau City at 1900hrs.